Choose your best Dressing style by knowing your body type. . .
By knowing what type of clothing suits your body type you can create your own unique style by mixing and matching. Your dressing sense must be something out of your own mind and for choosing a perfect style for yourself you should know your body type. It isn’t necessary to follow any superstar or any particular brand but by knowing what type of clothing suits your body type you can create your own unique style by mixing and matching. Accessories never beautify you but they only add to your natural beauty. The style is something that comes from your heart and attitude, if you are stylish from your heart you will always be the soul of the place wherever you stand. When your upper half is heavier that the lower half, it is considered as an Apple shaped body. The long tops, V-neck tops, wrap dresses and A-line dresses suits this body type. You must avoid dressing sense focused near your waist and mid-section. For your Broad shoulders, you may go for strapless tops and a stylish belt can show off your tiny waist. 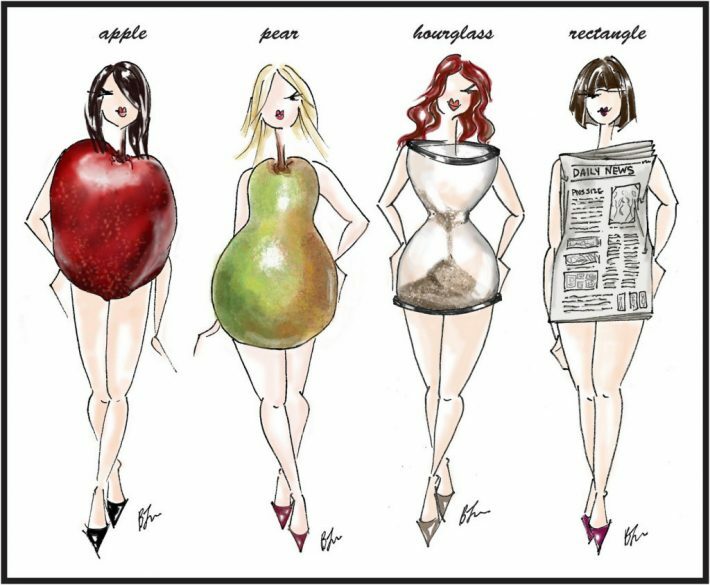 When your lower body is wider that your upper body and the mass is concentrated in your lower half you are having a pear shaped body. What style must you carry? The pear shaped body is slightly common in most of the woman and your style must highlight the shoulders and torso. Put on the clothes like boat neck tops with cap and puff sleeves. Since you are heavier in your lower half you must avoid the tight pants, skirts and choose the dark color for lower half along with light colored clothes for the upper half. So what if your body isn’t gifted with natural curves, your clothing must define each and every slight curve of your body. For rectangular shaped body your dressing style must be different from other body shapes. Wearing a belt to the lower part of the waist will work for you. To create an illusion of an hourglass shape you must go for Peplum jackets, tops, dresses and skirts. You should also wear the accessories that add volume to your upper half. If your body falls in this category, luckily you are one of the total 8% women in this world having an hourglass-shaped body. You are gifted with sharp curves and you must show it off by choosing best Dressing style for yourself. Your curves are your plus points and they must be highlighted for sure. Wear best fitting clothes and be choosy for your inner clothing as your bust is large. You may go for v necked top and pencil skirts. Whatever you wear, be attentive not to choose the bulky dress style.